The parish Church of St Edmond served a number of small settlements: Adbolton, Bassingfield, Holme, Pierrepont and Lamcote. 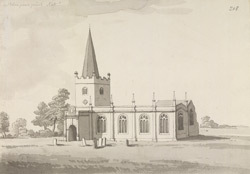 White's Directory of 1853 notes: "The church, dedicated to St Edmund, contains numerous monuments of the Pierrepont family. Its form is gothic, but in the style of the time of Henry VII, with large and numerous windows, and consisting of a nave, side aisles, and a square tower surmounted by a handsome lofty spire."